Below the Sun. Fantastic moniker from heretofore unknown Russian band. Temple of Torturous. Small, strictly underground Swedish label, which has a knack for interesting genre defying bands (Fyrnask, Nebelung). The combination promised to be very enticing, but the results surpassed all of my expectations. The band prefers to be called atmospheric sludge and keeps its members incognito, to focus all of their attention on the music. I am perfectly fine with this tactics, but Below the Sun music, to me, is so much more than sludge. It is really many of extreme genres combined. Position Envoy somewhere between Isis, Neurosis and Mournful Congregation, since it has definite funeral doom elements, but there are also industrial, noise, and black influences. Mostly instrumental, when Below the Sun decides to bring vocals into the mix, they also add a deathly element with the horrid bellowing, just like they do in Outward the Sky announcing the track arrival after the intro of atmospheric distorted guitars and cymbal-only percussion. The lift-off takes places around 3 min into the track, elevating Outward the Sky into the deep caverns of cosmos. The next chapter opens up with an atmospheric melody around 4’40”, stretchy glide building into full force, wafting aforementioned funeral doom, voice projecting all kinds of pain. 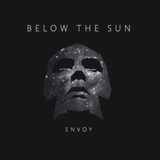 To listen to Below the Sun is to experience total trance in many varieties. Cold clear guitar notes may feel like cold water dripping behind your collar, then rise into melodic blackened tremolo, similar to Agalloch or Winterfylleth, but with much juicier bottom end (Cries of Dying Stars). Either way, if you close your eyes and let the wall of music wash over you, the astral cold shrillness will completely take over. Yet, after the first two tracks Envoy gets even less straightforward, if you can call Outward the Sky and Cries of Dying Stars straightforward. The easy listening stops with Alone. The composition runs the wide gamut of emotions. From oppressive, caged, desperate and pissed, quiet whispers give away the fear of going mad, while being, you guessed it, alone. Tragic melody can be heard later on no matter how heavy the pounding gets. Drift in Deep Space takes the wrathful darkness further. Amp busting, pain inducing, hope squashing, blackened noise is the destination here, and mastering engineer Mell Dettmer working with SunnO))) is something reflected in hideousness of Drift in Deep Space. After sounds like Drift in Deep Space, one needs a break, which Breath of Universe provides. Lonesome, percussionless, with ebbing galactic darkness, Breath of Universe relieves the pressure Drift in Deep Space brought upon us, with the hope that there is a new star to be born somewhere out of the compressed cosmic dust Drift in Deep Space piled on. Yet, the closer The Earth rips the veil away from cosmos, or so I feel, and brings Below the Sun back to earth. The cold shrill guitar reappears, and provides for one incredible melody ending with an alarming outro and heavy pounding which basically slams the door shut, dissolving The Earth into the sounds of surrounding nature, something we, humans, can always have provided we take care of it. The cosmos Below the Sun painted is out there, but it can be bizarre, unkind, and bottomless place, while Earth will always be home. The band made their album around the concept of Voyager-1 travelling in space, paving the way and introducing mankind to the stars. Whether that will happen, or Voyager will simply carry mankind’s mementos in the harshness of space, but somehow after listening to Envoy I personally prefer staying here and let the unmanned robot deal with the lonely dark journey.